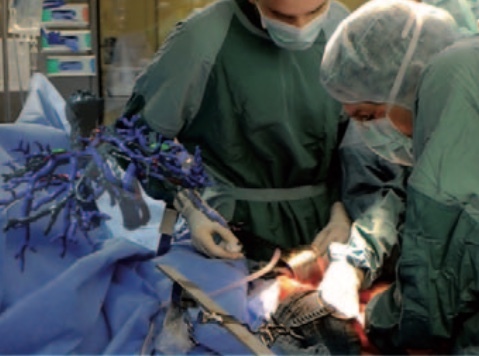 I published the paper „Mixed Reality in vis­ce­ral sur­ge­ry – Development of a sui­ta­ble work­flow and eva­lua­ti­on of in­tra­ope­ra­ti­ve use-cases“ in Annals of Surgery. The pa­per eva­lua­tes the ap­p­li­ca­ti­on of a mi­xed rea­li­ty (MR) head-mounted dis­play (HMD) for the vi­sua­li­za­ti­on of ana­to­mi­c­al struc­tures in com­plex visceral-surgical in­ter­ven­ti­ons. The project is directed by Prof. Igor Sauer and conducted at Charité University Hospital Berlin. Authors are I.M. Sauer, M. Queisner, P. Tang, S. Moosburner, O. Hoepfner, R. Horner, R. Lohmann and J. Pratschke. Download„Mixed Reality in vis­ce­ral sur­ge­ry – Development of a sui­ta­ble work­flow and eva­lua­ti­on of in­tra­ope­ra­ti­ve use-cases“ (via Academia.edu). Citation: Sauer, Igor M.; Queisner, Moritz; Tang, Peter; Moosburner, Simon; Hoepfner, Ole; Horner, Rosa; Lohmann, Rudiger; Pratschke, Johann: „Mixed Reality in vis­ce­ral sur­ge­ry – Development of a sui­ta­ble work­flow and eva­lua­ti­on of in­tra­ope­ra­ti­ve use-cases“. In: Annals of Surgery, 2017 Aug 1. doi: 10.1097/SLA.0000000000002448.